Senator Kirsten Gillibrand (D-NY) and Rep. Jackie Speier (D-Calif.) introduced legislation on Thursday to allow transgender people to openly join and serve in the military, countering both Trump’s policy to keep enforcing the ban on transgender troops as well as a recent Supreme Court decision to temporarily uphold Trump’s policy. Both sponsors brought transgender service members to the State of the Union earlier this week, along with representatives A. Donald McEachin of Virginia and Chris Pappas of New Hampshire. 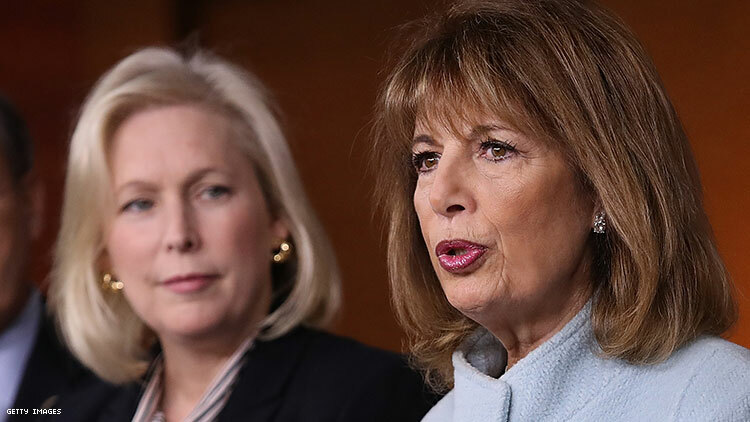 On the Senate side, Gillibrand was joined by other members of the Senate Armed Services Committee, Sen. Jack Reed (D-R.I.) and Sen. Susan Collins (R-Maine). The same group introduced a similar bill in 2017 with the late Sen. John McCain (R.-Ariz.), after Trump initially tweeted about the ban, The Hill reports. “Since Donald Trump's first tweets, a bipartisan chorus of members of Congress, national security experts, and an overwhelming majority of Americans have made clear their opposition to this unconstitutional policy,” Sarah McBride of the Human Rights Campaign said in a statement. And yet the RAND Corporation found in 2016, that trans-inclusive health care would add “a 0.04 to 0.13 percent increase in active-component health care expenditures.” The decree prompted multiple lawsuits, which have been winding through federal courts, which prompted injunctions against the policy. Most recently, though, the Supreme Court decided to lift some lower courts’ injunctions, thus putting it on hold. According to The Hill, the bill would bar the military from discharging anyone currently serving in the military on the basis of their gender identity, nor would the military be able to turn away transgender people from joining solely because of their gender identity. Speier was joined by Joseph Kennedy (D-Mass. ), John Katko (R-N.Y.), Anthony Brown (D-Md. ), and Susan Davis (D-Calif.).